Fact Sheet: Do you know Roe? First I'd like to extend a big thank you to all the parishes who participated in the 40 Days for Life campaign that ends this week. I hope you can join us for the moving conclusion during our final Victory Hour of prayer and inspirational witness this Sunday, November 4, at 5 p.m. at the South Dallas Planned Parenthood abortion facility , celebrating the 12 lives saved (and those are just the ones we know about!). Everyone is Invited to the 4th annual Pasos por la Vida, our yearly Eucharistic procession for LIFE. This year, the procession will begin at Mount Carmel Center to the rally at Santa Clara Parish, featuring presentations (en español) on LIFE, our Catholic faith in these times, and our calling to #BeGolden. November marks National Adoption Awareness Month. CPLC encourages the option of adoption through our Project Gabriel Ministry. At our next Parish Coordinator meeting on November 10 at St. Mark Pastoral Center in Plano, we will welcome Carolina Salazar with 25 years of experience in adoption at CPLC and Catholic Charities. She will be joined by personal testimonies who will share what the modern adoption experience is really like. For more information on adoption, visit prolifedallas.org/adoption and check out our social media this month at facebook.com/prolifedallas . 3. SHOP AND LUNCH FOR LIFE! On November 17 , we will celebrate our Project Gabriel scholarship recipients at the annual Christ Child Christmas Gift Market & Luncheon , benefiting the CPLC, as well as Bella House and Mater Filius maternity homes. This year will be bigger and better at a new location -- Renaissance Addison -- with more vendors, plus live music! As always, the market is open to the public for FREE from 9 a.m. - 4 p.m. Reservations for our luncheon, featuring a special presentation by Fr. Baynham from St. Joseph on How to make Advent Special for Your Family , are open here and going fast! Please spread the word and book your parish or group table today. An acclaimed experience of a LIFEtime for high school teens is coming up! From January 17-20, Youth For Life will travel to Washington D.C. for the national March for Life. Save money by registering here before Nov. 6 (and enter an Essay Contest for a full trip scholarship!). The final deadline to register is Nov. 13. Safe-environment chaperones are also needed. More details here. November also offers the last opportunity of the year to experience healing through a life-changing Rachel's Vineyard™ Retreat for women and men suffering from a past abortion experience. The retreat is Nov. 9-11, in English. View the 2019 schedule of retreats here. Roe Memorial Mass - 10:00 a.m. at Cathedral Shrine of the Virgin of Guadalupe, celebrated by Bishop Burns. 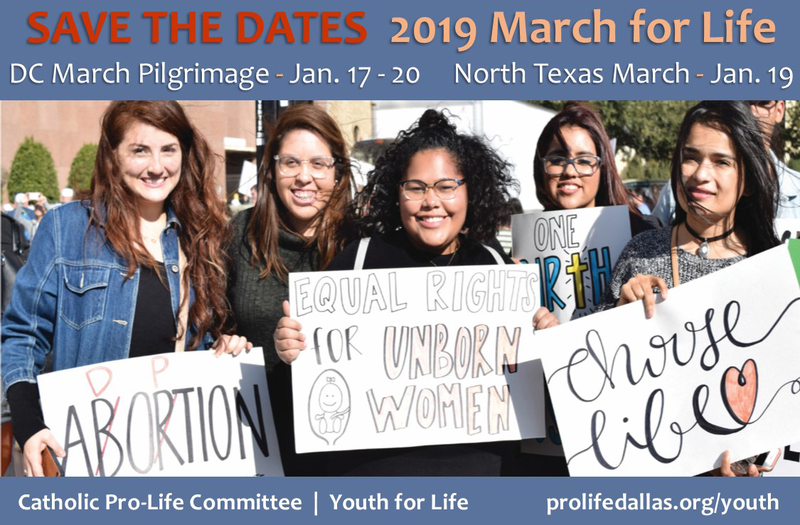 North Texas March for Life - 12:30 p.m. from Cathedral to rally at federal courthouse. Promotional flyers are linked in the left sidebar with additional items available here. On November 23, we also celebrate Blessed Miguel Augustin Pro. "¡Viva Cristo Rey!" -- Long live Christ the King! -- were the last words Pro uttered before he was executed for being a Catholic priest and serving his flock. Father Pro immediately returned to Mexico, where he served a Church forced to go "underground." He celebrated the Eucharist clandestinely and ministered the other sacraments to small groups of Catholics. He and his brother Roberto were arrested on trumped-up charges of attempting to assassinate Mexico's president. Roberto was spared, but Miguel was sentenced to face a firing squad on November 23, 1927. His funeral became a public demonstration of faith. Miguel Pro was beatified in 1988. Let us all have Miguel Pro's conviction as we continue to promote life. Looking forward to seeing you on Nov. 10. God Bless!